Used to make sour curry soup. 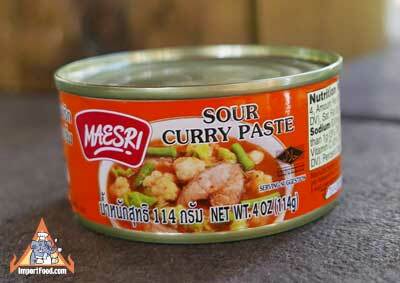 The main ingredient for many Thai sour soups found in our recipe section. Maesri Brand is recognized in Thailand as a high quality export product with rich taste and authentic flavor. Ingredients: dried chile 30%, onion 22%, barracuda fish 20%, tamarind juice 20%, sugar 4%, salt 4%. Thai main courses that bring vibrancy to any dinner party. Classic Som Tum, Neua Pad Prik, Gaeng Ped Gai, and many more. Discover some of the tastiest noodle and rice dishes on the planet. From Pad Thai to Lad Na, our recipes are unique, authentic, delicious. Thai sauces constitute some of the most interesting and flavorful condiments found anywhere; browse our vast selection of recipes. Delightful and flavorful vegetarian options, from Thai-style noodles with peanut and basil sauce, to spicy Thai corn cakes. Prepare a distinctive meal using ingredients you never thought of pairing with your fish, like pineapple curry, tamarind, green mango and roasted chile paste. This selection of delicious Thai recipes has some American influence. Try some lemongrass chicken, sweet chili baby back ribs, and more. Around the world, Thai soups are known for being incredibly complex and delicious, capable of combining sour, spicy, sweet, and salty flavors. These dishes will be sure to impress your family and friends with their exotic flavors, textures and scents. Street vendors are a quintessential part of Thailand, and their recipes are truly unique. Browse our recipe selection to make a fun cultural dish. Your one-stop shop for a huge selection of most loved Thai dishes, from Pad Thai to Chicken Satay. We may specialize in Thai food, but Japanese cuisine is another delicious option for those looking to explore Asian recipes!